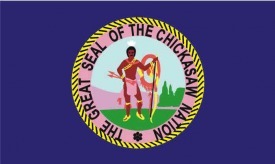 The Chickasaw tribe lived in the South of this country. There were Chickasaws in Tennessee, Alabama, Kentucky, Mississippi. They lived in one-room log cabins, and each tribe was led by a chief. They supported themselves by hunting, fishing, and trading with different tribes. This may seem peaceful, but they were warriors. They fought for Britian when they fought France and Spain for control of the South, and they fought again for the British against America during the Revolutionary War. Then, in the Civil War, they fought for the Confederacy. The Chickasaws were fierce warriors, but they knew that removal was an eventuality. 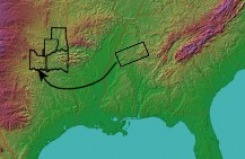 They even looked over Arkansas land to find a site for relocating the tribe. When they found the land uninhabitable, or not nood enough for them, Levi Colbert, a tribal leader, wrote a letter to Jackson stating that they found the land unacceptable. They ended up signing an official treaty to relocate in 1837, and their relocation landed them in Oklahoma, where over 5,000 Chickasaw decendants live today. During the removal, this tribe took part in the famous Trail of Tears. Although, this event is best known for the removal of the Cherokee tribe.